Home/Pre-season Preparations/Getting ready for the season – First Aid refreshers! Spring time seems to creep up, its winter winter winter and then all of a sudden we are on a daily countdown till the season starts. Isn’t that always the way?! There are so many things to do in so little time…food purchasing and prep for 25+ trips of 7 – 10 days in duration, vehicle inspections, gear inspection and maintenance (not to mention new gear wish lists – mine is a little out of control at the moment but I am sure that is another blog post in the making), training hikes, and re-certifications are just a few things that pop into my head. 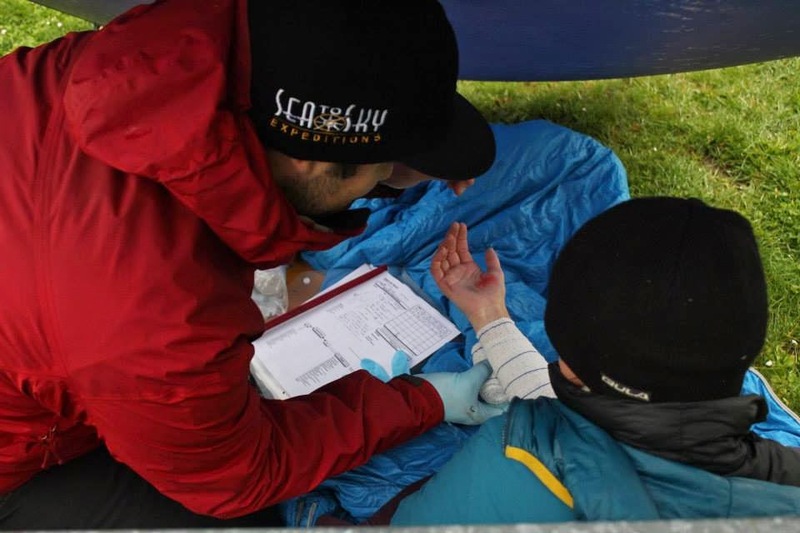 Most of us at Sea to Sky have been with Slipstream First Aid for many years as they are just the best in the business. They have an extended program that allows you to hop into any course (if space available) and refresh your skills, something other companies don’t do. It is great to start thinking about risk management, safety, first aid scenarios, evacuations and the like at the beginning of a season. I am due up for re-cert next year so hopping into these individual days helps me keep my skills fresh but also make my re-cert easier next season, after all if you don’t use it you’ll lose it! PLUS you get to meet fantastic like minded professionals in the industry. Mark and I decided to hop into a course that one of our guide’s (JP) was re-certifying on and chose the rainiest coldest weather we could muster up for April on the west coast – not intentionally but those are the conditions that we have all been in when you need to be on top of your game and fully functional in. The gentleman at the front desk recommended an AMAZING Indian restaurant about 8 blocks away called Tandoori Kona that blew our minds. I would drive out there just for dinner! It doesn’t look like much from the outside but the food was so flavourful and authentic. Wow. Just read the reviews. Really, you must eat there!! 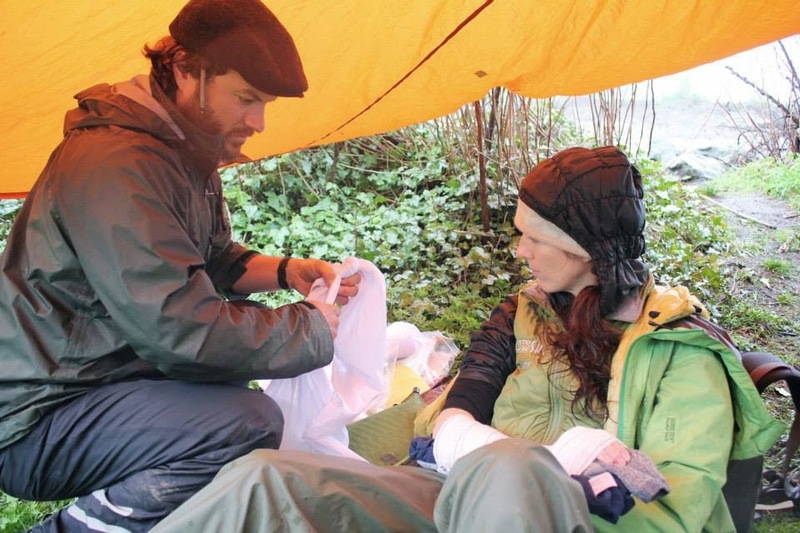 So what is wilderness first aid you might ask? Well in most first aid courses in the city you have access to various things that make first aid different – a largely stocked first aid kit, medical supplies, medical clinics and hospitals within a short driving distance. In the wilderness you are limited to the resources you have with you and accessible to you. Wilderness first aid practices and protocols are applicable if you are further than 2 hours away from help. So we end up learning items that we can improvise if we don’t have something – like how to make a stretcher out of tree branches, tarps/backpacks/PFD’s. Adaptability is the key to thriving in an ultimately changing environment. The course itself usually has a classroom component and a few days inside of a city park in the elements practicing scenarios and long term patient care. We were at a bit of a disadvantage in that the course was on day 8 so all the students were feeling relatively dialed and we were feeling a bit rusty. But I suppose it is just a matter of jumping in with 2 feet and unlocking the knowledge that is inside our heads. You learn just as much as a “patient” as you do as a “rescuer”. The photos appear as though the weather wasn’t too bad…hmmmm, photos never do it justice lol! Being a patient for spinals is rather challenging…its a long slow process and you are laying on the cold ground rapidly losing body heat. It is also a hard position for someone to hold a patients head in for a long period of time. All valuable reminders…both of being a rescuer and of being a patient. Thanks for reading! Some of our upcoming posts will be on training hikes, food dehydration tips & recipes and how to physically train for demanding hikes.